adhesion, surface treatments, and polymer film modification. The wetting of solid substrates by liquids is a basic element in many natural and commercial processes. Contact angle is the angle between the tangent to the drop’s profile and the tangent to the surface, at the point of meeting between the vapor, the liquid and the solid. Contact angle is an index of the wettability of solid surface. A lower contact angle means that the hydrophilic and high-energy surface. But a higher contact angle means that the hydrophobic and low-energy surface. SEO Phoenix 300 Touch is the latest product in our contact angle analyzer. It features innovative features with automated, fully software control liquid drop volume. 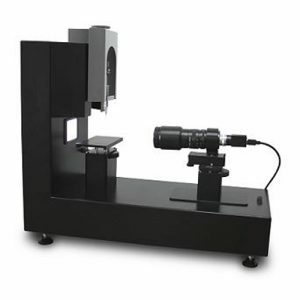 In order to produce accurate and reproducible contact angle results, the Phoenix 300 Touch featured the intelligent automated Z-head controls. This Touch feature will automatically move the Z-head to drop a single drop of liquid onto the sample; the user can have a peace of mind for the consistency of how droplet is introduced onto the sample surface. Improved precision and reproducibility by the elimination of operator error.